Dalhousie Swallow-Wort is a twiner characterized by greening flowers with narrow-oblong petals turned back. Flowers are borne in stalked clusters arising at nodes. Stalks are about 7.5 mm long. Flower-stalks are about 8-9 mm long, velvety. Bracts are about 1.5 mm long, linear. Sepal cup is 1.5 mm long, sepals ovate, almost reaching the base, velvety, particularly on the margin. 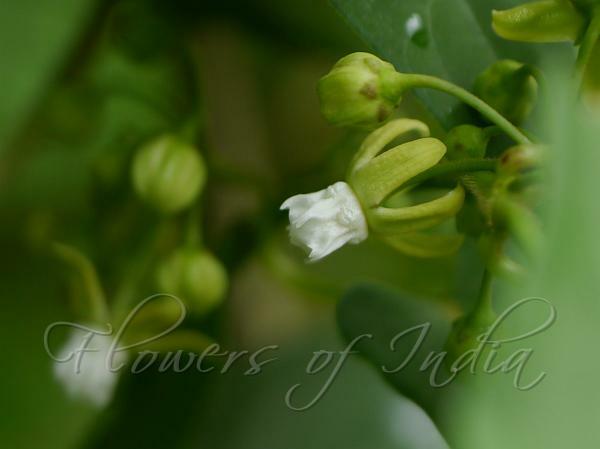 Flowers are about 5 mm long, petals almost reaching the base, oblong, hairless, becoming reflexed. Corona is bell-shaped, 5-10 toothed, about 4 mm long, with 5 small scales near the base within. The plant has slender branches with a line of hairs running along the inter-node. Leaves, 7.5-12.5 cm long, 1.2-2.5 cm wide, are oblong-lanceshaped, deeply heart-shaped at base, minutely velvet-hairy on both sides, pale on the under surface. Follicles are 10 cm x 1.2-1.3 cm, smooth pointed. Dalhousie Swallow-Wort is found in the Himalayas, from Himachal Pradesh to Nepal, at altitudes of 1500-2500 m. Flowering: July-August. Identification credit: Gurcharan Singh Photographed on Govindghat-Ghangria route, Uttarakhand.